A couple of weeks ago a attended a daylong Drapplique workshop given by instructor Pam Holland. It was one of the workshops associated with the Great Arkansas Quilt Show 3. Had I known the techniques I learned, my quilt entry for the GAQS would have been a better quilt (assuming I had achieved some measure of skill with the techniques). 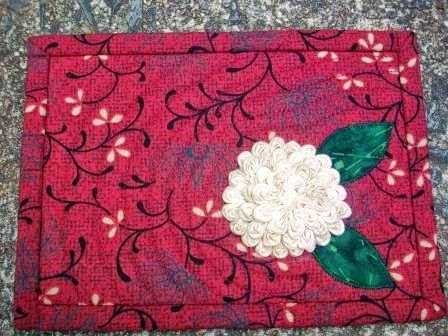 Here is my small quilt from the workshop. It measures 11.75 in x 12.25 in. As you can tell from the roots in this photos I am currently better at coloring than drawing/shading in colors. I hope to improve with time and practice. 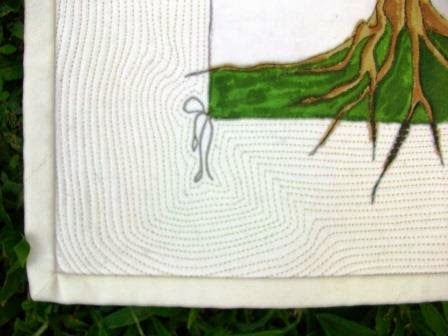 I don't have good photos from the quilt show, but would encourage anyone living in or coming through the Little Rock area over the next several months to attend the show. There are some gorgeous quilts! My entry is my quilt "Fantasy Footwear." Here are more fabric postcards done this summer. 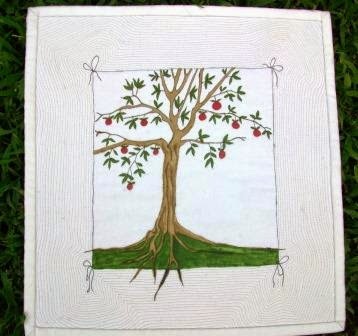 This first one features an "orphan" rushed rose which didn't make it into a quilt. It measures 5 in x 7 in. I mailed it to my roommate from college. This one might have been improved using the shading techniques learned at the Drapplique workshop, but it works well as a redwork piece. 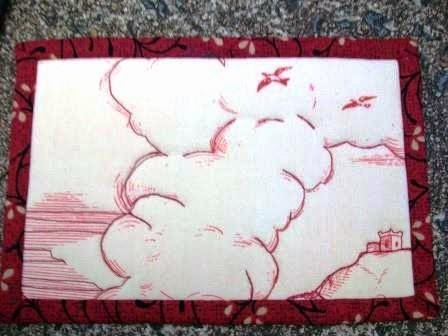 It measures 5 in x 7.5 in. I mailed it to a longtime friend for her birthday. This one definitely could have been better using the techniques from the Drapplique workshop. I may have to try another version of it. It measure 7.5 in x 6 in. 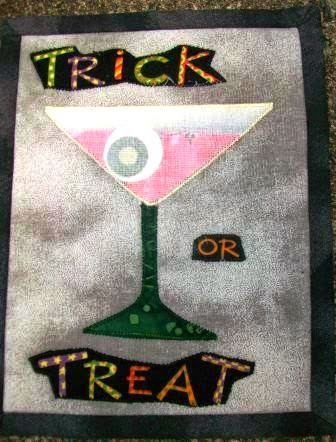 I may mail it to someone as a Halloween card. 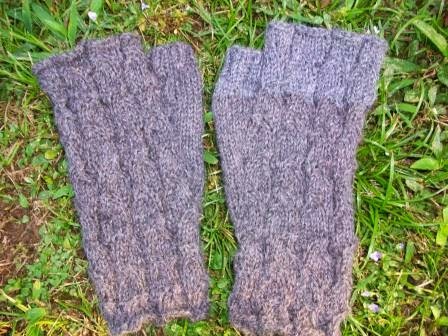 I made these mittens mostly using some yarn given to me by a colleague's wife. The fiber content was unknown and a ran out just shy of finishing the second mitten. I guessed at the yarn (baby alpaca) and got close but not an exact match. The pattern is Fallberry Mitts by Anne Hanson. 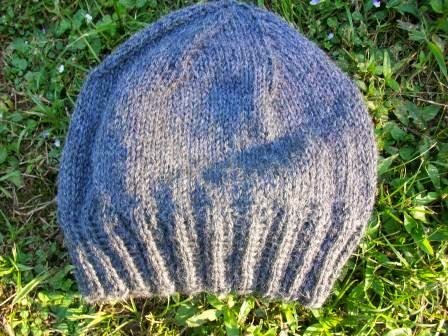 I then used the remainder of the purchased yarn to make this basic hat. The pattern is Regular Guy Beanie by Chuck Wright. I made this shawl/scarf at the request of a friend. She asked for something soft, airy, and lacy. This project took me several months to complete. It frustrated me at times when I had to undo rows to correct a mistake, but I am pleased with the end result. So is my friend. 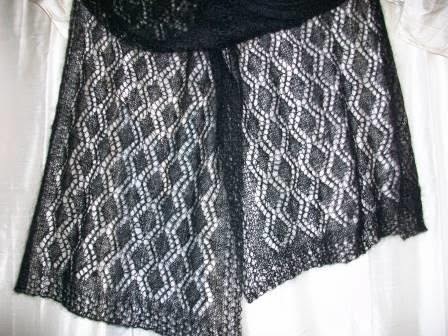 The pattern is Pleasing Reversibility in Lace by Jackie Erickson-Schweitzer. 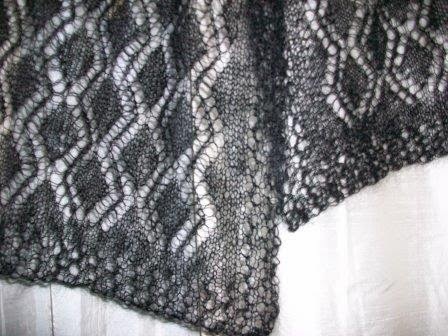 The yarn is Shibui Knits Silk Cloud. The finished blocked shawl/scarf is 20 in X 70 in. Here is a photo to try to show more detail.